Back by popular demand, the Taste of India Dinner returns to Aerie Restaurant & Lounge on Saturday, January 19. The first event sold out, so get tickets early. When Yeshwant Reddy and Mangesh Hegde came to Grand Traverse Resort and Spa in Acme earlier this year, neither of them expected to meet another chef from Mumbai. Both chefs came to the resort for a culinary internship program, though the term “internship” doesn’t do justice to their knowledge in the kitchen. Mangesh shares that he has already been working as a chef for nine years. “We are done with school and have years of experience. After getting that experience, we get this chance,” he says. Mangesh comes from a family of fishermen and has worked in the kitchens of luxury hotels and cruise lines, while Yeshwant’s cooking background includes everything from a traditional Italian restaurant to a five-star hotel. The chefs have a one-year gig at the resort, with the goal of getting to know the ins and outs of the American hospitality business. “We’re here to learn about American culture—how they live, what type of food they eat—and to get to know this industry,” Mangesh says. “The program keeps us revolving everywhere in the resort,” he adds, noting he splits his time between Aerie Restaurant & Lounge and the resort’s in-house bakery. But Mangesh and Yeshwant aren’t the only ones learning—the staff at Aerie had the opportunity to get firsthand experience with Indian cuisine November’s “Taste of India Dinner” led by the Mumbai chefs. The dinner was a fun addition to the resort’s 2018 Heritage Dinner line-up, which included the Filipino Dinner (April) and the Jamaican Dinner (October). In fact, that within two weeks of the new dinner announcement, the event had sold out. 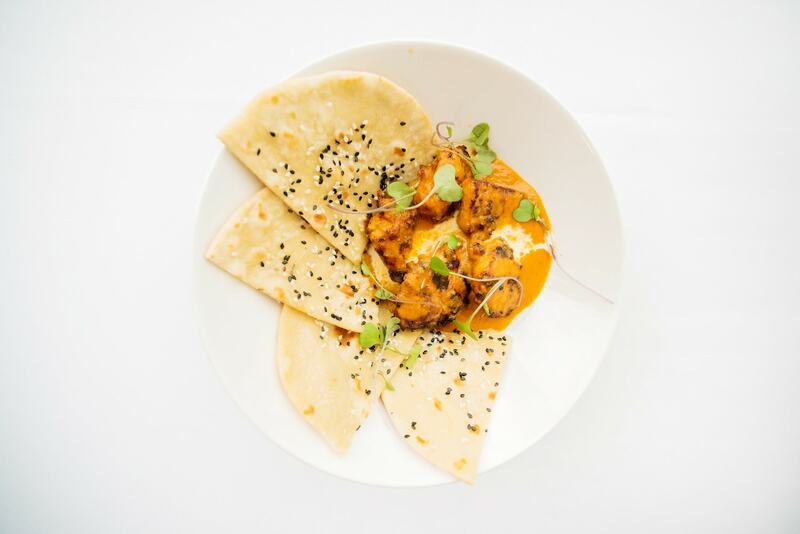 For the 200+ guests who jumped on the reservation train early, a mouthwatering menu provided them with dishes like chicken tikka, dal fry, tandoori salmon, and plenty of naan. After dozens of other would-be diners called to get on a waiting list, it was clear Northern Michigan was hungry for more. That’s why Saturday, January 19, the Taste of India Dinner returns to Aerie’s kitchen. The special menu is only available on January 19 at $35 per guest plus tax and gratuity. All ages are welcome. Reservations can be made by calling Aerie Restaurant & Lounge at 231-534-6800 or online. To tide Northern Michigan foodies over in the meantime, the chefs have shared a recipe for one of their favorite dishes: butter chicken. See it below. Combine chicken and spices in a medium glass bowl until all pieces are well seasoned. Heat butter in a skillet over medium heat. Add chicken and cook—turning every two minutes—until cooked through. Remove chicken from heat and set aside. In a separate pan, heat butter for the gravy. Add garlic, chopped onion, chopped tomato, salt, and pepper. Sautee until vegetables are tender (about 5–7 minutes). Add cashews and cook until cashews are tender (about 3–5 minutes). Allow gravy to cool for 5 minutes, then put into a blender or food processor. Blend until smooth. If desired, the gravy can be strained for extra smoothness. Combine chicken and gravy in a skillet over low heat until all ingredients are warm. If desired, add 1 tablespoon heavy cream. Remove from heat, serve, and garnish with fresh cilantro. Jillian Manning is the public relations manager at Grand Traverse Resort and Spa.